Ready for an entirely new kind of facial? One that does more for your skin and works – really works – for every type and color of skin? Meet HydraFacial MD®. HydraFacial MD goes beyond our popular facials, but it’s not as big a commitment as an in-depth laser treatment. It’s fast, it feels great, and you’ll love the result – skin that looks fresh and vibrant. HydraFacial MD not only cleanses and restores, it hydrates. It boosts firmness and elasticity, and it can improve skin texture and tone. 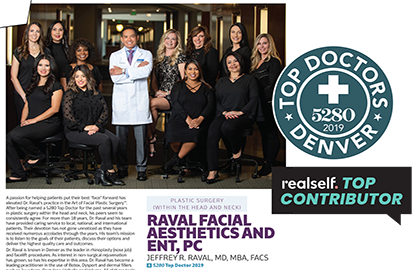 Dr. Jeff Raval says HydraFacial MD is especially good for those who have rosacea. Step 1: Cleanse and peel. This step gently relaxes and exfoliates the skin’s surface. Step 2: Extract and hydrate. This step painlessly removes debris and impurities, then infuses the skin with nourishing moisturizers. Step 3: Fuse and Protect: The final step bathes the skin’s surface with a blend of antioxidants, hyaluronic acid, and peptides. HydraFacial MD puts the “treat” back in treatment, because there is no discomfort or irritation. You’ll enjoy the experience as much as the results. And it takes just 30 minutes. Britenol Boost helps to brighten and smooth your complexion by minimizing the appearance of sun spots and other dark spots. Dermabuilder Boost uses a patented blend of peptides to recharge skin, helping reduce visible signs of aging. Growth Factor Boost targets connective tissue, helping to restore healthy skin and minimize the appearance of fine lines and wrinkles. You’ll see healthier looking, more radiant skin right away, and the hydrating benefits can last up to a week or more. Patients typically see significant improvement after 3 treatments. Over time, ongoing treatments can actually improve skin health. For best results, and to keep your skin in tip-top condition, we recommend continued treatments. After all, you don’t stop aging or exposing your skin to the elements, etc. 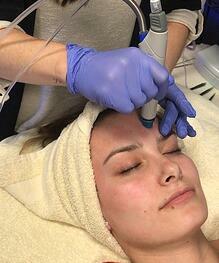 HydraFacial MD is highly effective, yet it’s gentle enough for weekly treatments. You are! HydraFacial MD is appropriate for any age adult. And unlike many other types of skin improvement treatments, HydraFacial MD is safe and effective for every skin type and every skin color. Let’s talk. Your face and skin are like no one else’s, so we want you to have a custom-tailored HydraFacial MD experience. A personal consultation allows us to learn your skin concerns and goals and work with you to devise the best treatment strategy for you.